Welcome to Beechwood Hall. 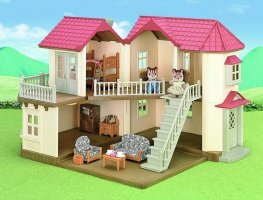 A lovely family home with working lights which any of your Sylvanians would be delighted to move in to. RRP £99.99; Special Offer price £69.99! Beechwood Hall is a beautiful family home with five rooms, 2 working lights and a reversible central panel with a green grass effect on one side so it can be used as a garden. Beechwood Hall can be extended with Cosy Cottage or Conservatory (sold separately). 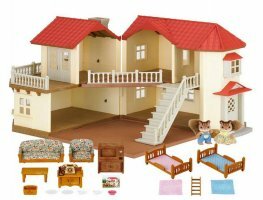 This fantastic gift set includes two walnut squirrel figures (usually £7.99 each) and living room furntire set (usually £19.99) and children's bunk beds (usually £7.99 each); saving you over £30 when compared to the price of purchasing house and contents separately. 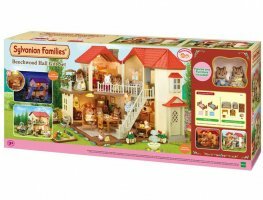 Gift Set includes bunk beds, living room furniture set, two working lights and 2 squirrel figures. Scenery, other figures & other furniture not included. Want to decorate your Beechwood Hall? No problem! Download free wallpaper to print out at home from our Downloads page HERE. Add up to 2 additional working lights to this building using L41 Home Interiors Set which you will find HERE. We have several varations of the Beechwood Hall Gift Set available. If you are looking for a specific version that you cannot see online, please contact us as we may also have the exact one you are looking for.